Publisher T&T Clark will soon offer the volume “Liturgy in the Twenty-First Century - Contemporary Issues and Perspectives”, edited by Dom Alcuin Reid. We are proud to say that three NLM writers, Fr Thomas Kocik, Dr Peter Kwasniewski, and Dr Jennifer Donelson are among the contributors, as well as Fr Christopher Smith from our sister blog The Chant Café. They join Cardinal Raymond Burke, Archbishop Salvatore Cordileone, Dr Lauren Pristas, Dr Michael Foley and several others in addressing a wide variety of important topics, including liturgical music, the Holy Week rites (a perennial favorite), youth and the liturgy (from the founder of a Juventutem chapter), the calendar, the Reform of the Reform, etc. 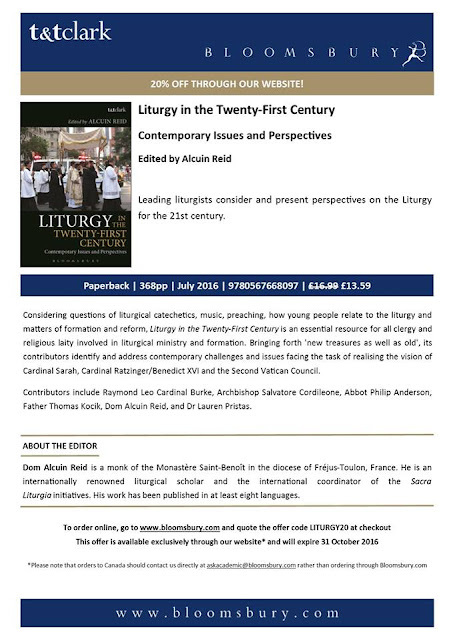 It is now available for pre-order; a special 20% discount is being given until October 31st when ordering through the T&T Clark website, as explained in the poster below; click the link for more information on the book, including the complete list of the essays.